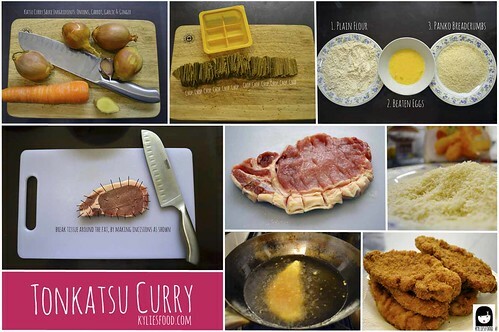 For my second post I thought I’d share with you a very simple dish and one of my all time favourite comfort foods – Katsu Curry. That’s right another Japanese themed post. 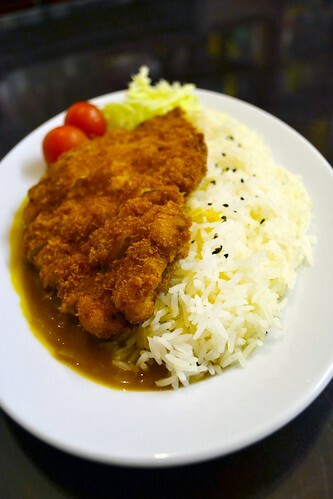 There’s just something about deep-fried breaded meat accompanied with silky smooth curry sauce and a bed of my staple carb go to – rice, that just makes you go mmmhmmm. Made popular to the masses here in the UK by Wagamama and the likes, it has been a solid crowd pleaser in many inexpensive Japanese restaurants, still nothing quite beats making it yourself at home. If you’re craving crispy breaded meat, the panko style crumb really hits the spot. Much different to western style breadcrumbs, panko is much lighter and stays crispier longer as it doesn’t absorb as much oil as regular breadcrumbs. Either way it’s a real hearty dish and will please most. Here’s my tonkatsu curry, I then smothered it in sauce after the photo, mmmmhmm. I’m using pork here because that’s what I had in my fridge at the time, but this is equally as good with a chicken breast or thigh fillet (Chicken Katsu Curry). You can make your own curry sauce from scratch, however here I’m cheating with a box of Japanese curry sauce mix, which come in roux blocks. There are different brands to chose from, though any Japanese curry sauce mix will do, I usually use the ‘Golden Curry’ brand by S&B but here I’ve used the ‘Vermont Curry’ brand by House Foods (see pic below). They also come in a range of spice levels: makuchi (Mild or Sweet), chuukara (Medium Hot) and karakuchi (Hot), you can find these at Japanese grocery stores and most ‘Asian’ supermarkets. In fact I think Tesco have a section selling these now. Say what?! : Did you know that curry was first introduced to Japan during the Meiji era (1868 – 1912) by the Brits, at the time when India was under British administration. It is now one of Japan’s national dishes. Yeah you already knew that. Serving suggestion: serve with a hot bed of rice and salad on the side, I had mine with a side of crispy shredded white cabbage and cherry tomatoes. 2. Add remaining chopped and diced vegetables and sauté until lightly browned. 3. When browned, add in the 5¾ cups of water and bring to a boil. 4. Grate the Ginger into the pot. 5. Meanwhile chop up your curry roux sauce mix into pieces so it will dissolve better. 6. Once the water has boiled, lower the heat to medium, add the pieces of curry roux mix, and stir until dissolved. 7. Simmer on low heat for 20mins and keep stirring occasionally, so it doesn’t burn. 8. When the sauce has reduced to your required consistency (depends on how you like it) season to taste, it is ready for serving. 1. Take your Pork fillet and score the fatty tissue as shown in the photo above. (This will prevent the fillet from curling up when fried) Feel free to remove any excess fat. If you’re using a chicken breast fillet there is no need to do this, but you should lightly flatten the chicken so it cooks evenly. 2. Place a sheet of cling film (plastic wrap) on top of the fillet. 3. Lightly pound the fillet to flatten and tenderise with a flat object, such as the bottom of a saucepan or a meat tenderising mallet. 4. Remove the film and reform back to original shape with hands. 5. Season the fillet on both sides with garlic powder, salt and pepper. 6. Do the same to every fillet. 7. Place your flour, beaten eggs, and panko breadcrumbs into individual plates or bowls and line them up as shown in pic above. 8. First lightly dredge the fillet into the flour until both sides are covered. 9. Then, dip the fillet into the eggs, let the excess egg drip off. 10. Place the fillet onto the bed of panko breadcrumbs and coat both sides. 11. Do the same to every fillet. 13. To check when the oil is ready for deep frying, drop a panko crumb into the oil and if it starts to bubble, the oil is ready. 14. Carefully place the crumbed fillet into the oil. I only cook 2 fillets at a time on medium heat. 15. When one side has turned golden and crispy, turn the fillet to the other side to cook further. 16. When both sides are nicely golden, crispy and cooked through, remove from the oil and place on a fat drainer/ plate with paper towels. 17. Repeat with the remaining fillets. 18. When done all you need to do is slice the fillets katsu curry style and place on top of a nice bed of warm rice, salad and a ladle of your lovely katsu curry sauce.